For realizing autonomous vehicle driving and advanced safety systems, it is necessary to achieve accurate vehicle localization in cities. 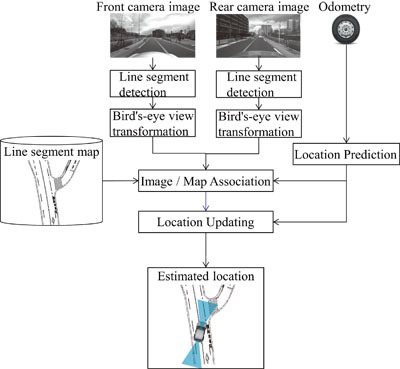 This paper proposes a method of accurately estimating vehicle position by matching a map and line segment features detected from images captured by a camera. Features such as white road lines, yellow road lines, road signs, and curb stones, which could be used as clues for vehicle localization, were expressed as line segment features on a two-dimensional road plane in an integrated manner. The detected line segments were subjected to bird’s-eye view transformation to transform them to the vehicle coordinate system so that they could be used for vehicle localization regardless of the camera configuration. Moreover, an extended Kalman filter was applied after a detailed study of the line observation errors for realizing real-time estimation. Vehicle localization was tested under city driving conditions, and the vehicle position was identified with sub-meter accuracy. K. Hara and H. Saito, “Vehicle Localization Based on the Detection of Line Segments from Multi-Camera Images,” J. Robot. Mechatron., Vol.27, No.6, pp. 617-626, 2015. J. Ziegler, P. Bender, M. Schreiber et al., “Making bertha drive? An autonomous journey on a historic route,” IEEE Intelligent Transportation Systems Magazine, Vol.6, pp. 8-20, 2014. J. McCall and M. Trivedi, “Video-based lane estimation and tracking for driver assistance: Survey, System, and Evaluation,” IEEE Trans. on Intelligent Transportation Systems, Vol.7, No.1, pp. 20-37, 2006. B. Wu, T. Lee, H. Chang et al., “GPS navigation based autonomous driving system design for intelligent vehicles,” IEEE Int. Conf. on Systems, Man and Cybernetics, pp. 3294-3299, 2007. M. Noda, T. Takahashi, D. Deguchi et al., “Vehicle ego-localization by matching in-vehicle camera images to an aerial image,” Asian Conf. on Computer Vision 2010 Workshops – Computer Vision, pp. 163-173, 2011. D. Wong, D. Deguchi, I. Ide et al., “Single camera vehicle localization using SURF scale and dynamic time warping,” Proc. of the IEEE Intelligent Vehicles Symposium, pp. 681-686, 2014. H. Lategahn, M. Schreiber, J. Ziegler et al., “Urban localization with camera and inertial measurement unit,” Proc. of the IEEE Intelligent Vehicles Symposium, pp. 719-724, 2013. H. Yu, H. Hsieh, K. Tasi et al., “Visual Localization for Mobile Robots Based on Composite Map,” J. of Robotics and Mechatronics, Vol.25, No.1, pp. 25-37, 2013. D. Zhang, R. Kurazume, Y. Iwashita et al., “Robust Global Localization Using Laser Reflectivity,” J. of Robotics and Mechatronics, Vol.25, No.1, pp. 38-52, 2013. M. Schreiber, C. Knoppel, and U. Franke, “LaneLoc: Lane marking based localization using highly accurate maps,” Proc. of the IEEE Intelligent Vehicles Symposium, pp. 449-454, 2013. S. Nedevschi, V. Popescu, R. Danescu et al., “Accurate Ego-Vehicle Global Localization at Intersections Through Alignment of Visual Data With Digital Map,” IEEE Trans. on Intelligent Transportation Systems, Vol.14, No.2, pp. 673-687, 2013. F. Chausse, J. Laneurit, and R. Chapuis, “Vehicle localization on a digital map using particles filtering,” Proc. of the IEEE Intelligent Vehicles Symposium, pp. 243-248, 2005. J. Levinson, M. Montemerlo, and S. Thrun, “Map-Based Precision Vehicle Localization in Urban Environments,” Robotics: Science and Systems, 2007. N. Mattern, R. Schubert, and G. Wanielik, “High-accurate vehicle localization using digital maps and coherency images,” Proc. of the Intelligent Vehicles Symposium, pp. 462-469, 2010. Y. Yu, H. Zhao, F. Davoine et al., “Monocular visual localization using road structural features,” Proc. of the IEEE Intelligent Vehicles Symposium, pp. 693-699, 2014. J. Ziegler, H. Lategahn, M. Schreiber et al., “Video based localization for Bertha,” Proc. of the IEEE Intelligent Vehicles Symposium, pp. 1231-1238, 2014. I. Puente, H. Gonzalez-Jorge, J. Martinez-Sanchez et al., “Review of mobile mapping and surveying technologies,” Measurement, Vol.46, No.7, pp. 2127-2145, 2013. J. Ziegler, P. Bender, and T. Dang, “Trajectory planning for Bertha – A local, continuous method,” Proc. of the IEEE Intelligent Vehicles Symposium, pp. 450-457, 2014. G. Klein and D. Murray, “Parallel tracking and mapping for small AR workspaces,” ACM Int. Symposium on Mixed and Augmented Reality, pp. 225-234, 2007. R. Pless, “Using many cameras as one,” IEEE Conf. on Computer Vision and Pattern Recognition, Vol.2, pp. 587-593, 2003. R. Gioi, J. Jakubowicz, M. Morel et al., “LSD: A fast line segment detector with a false detection control,” IEEE Trans. on Pattern Analysis & Machine Intelligence, Vol.32, No.4, pp. 722-732, 2008. K. Hirose and H. Saito, “Real-time Line-based SLAM for AR,” The 3rd Int. Workshop on Benchmark Test Schemes for AR/MR Geometric Registration and Tracking Method, 2012. H. Masuda, M. Mizutani, and M, Kimura, “ITS Application: First Step in Automated Cruise System,” Toshiba review, Vol.55, No.11, pp. 23-26, 2000 (in Japanese).